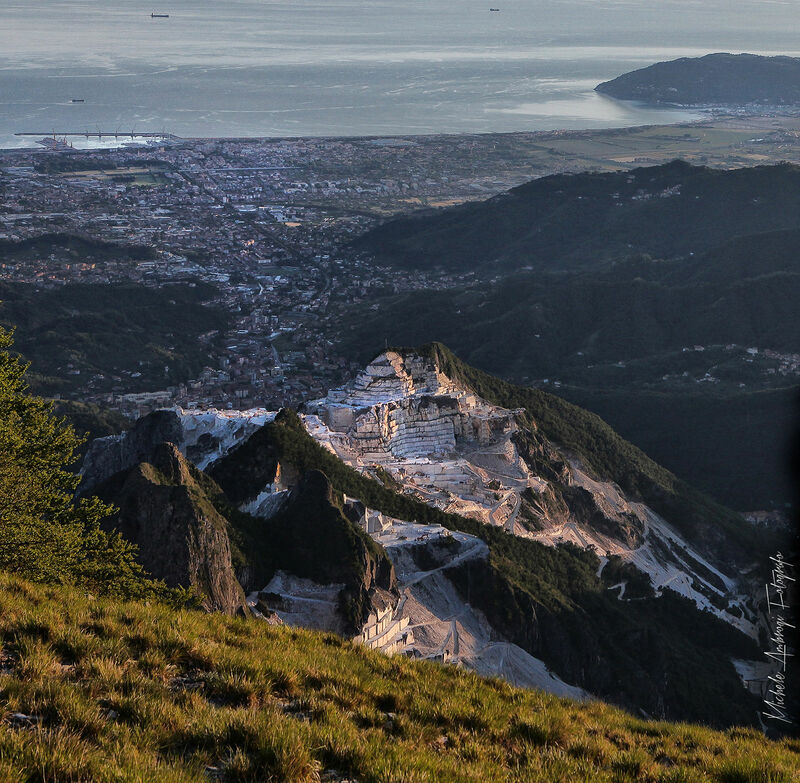 Carrara has always been considered the city of marble, and for good reason. The identity of this centuries-old city—with strong ties to both the mountains and the nearby Ligurian Sea—has always had marble at its heart: the pristine stone has been extracted from area quarries since Roman times. When you hear or utter “Carrara,” marble and quarries are the immediate associations. After all, it’s “white gold,” well-known to artists of all eras and origins. The city’s oldest centrepiece was the Pieve di Sant’Andrea, which eventually became the magnificent Cathedral. In the 13th century, it was protected by a wall that also guarded the Rocca (Citadel) and the Palazzo Comunale. Both the city’s coat of arms and name were marble-related: the city symbol is a wheel, and the name has similar connotations. Many believe it derives from Cararia, or “place of wagons”, referring to the wagons used to transport marble blocks. The coat of arms (which can be seen in detail on the rose window of the Duomo) has long been associated with the motto: FORTITUDO MEA IN ROTA. Wrapping up the historic overview, in 1557 Alberico I Cybo Malaspina expanded and modified the city layout, with new walls enclosing the towns of Caffaggio and Grazzano. Within the new setup, the beautiful piazza Alberica was also put in place. During the 19th century, the city underwent a second expansion as the stone industry developed. Within that same period, a port for marble shipment was constructed, along with a jetty attached to the railway station of Avenza and the Ferrovia Marmifera, which led directly to the quarries. Any visit to Carrara has to include a stop at the Castello Malaspina, a citadel that represents independence—from the hands of the bishops of Luni, specifically. During the 13th century, secular forces strengthened the village’s military organization by reinforcing the citadel. Over the centuries, the defense structure has transformed into a magnificent noble residence, and, since 1805, has been the headquarters of the Accademia di Belle Arti. To understand the history and vocation of the city, a visit to the lovely Civic Museum of Marble (Museo Civico del Marmo) is a must. Open since 1982, the exhibition space comprises six internal sections and an external area that offers visitors and complex and fascinating look at the local heritage, beginning with Roman archaeology and history of the territory and leading up to depictions of the most innovative techniques of Modern sculpture in marble and in other materials. But the visit can’t end until you’ve wandered through the Parco delle Alpi Apuan (Apuan Alps Park), the tips that surround the city. This mountainous chain is unique in its characteristics and develops over 60 kilometers along the areas of the Versilia, Lunigiana and Garfagnana. In addition to being well-known for the beauty of its marble, it’s also famous for the deep abysses between the mountains, its evocative quarries and breathtaking panoramic views that take your gaze from the pure white peaks to the nearby sea.